Who hasn’t experienced that feeling you get when you step up on the first tee, look around, and see 10 people watching you. Judging you. Waiting for you to hit the ball. Who are they to judge us? How easy it must be to watch us with those smug expressions knowing ALL too well we will not be there to make them squirm. Well, suffer no more my amigos! 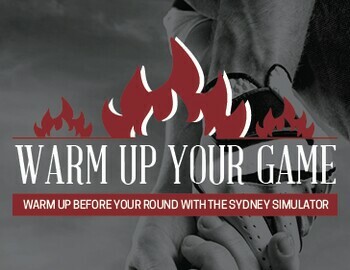 We are now opening the Sydney Simulator to our golfers for 5 minute warm-up intervals. Don’t make the mistake of cold-shafting one into Lake Michigan while Mr. and Mrs. Stare-too-much look on. Get those whiffs, blocks, shanks, slices, snap-hooks, and chunks out of the way by warming up in the Sydney Simulator! Then we’ll see who feels pressure. Then we’ll see whose laughing while confidently striding down the middle of the fairway, while fresh meat enters the First Tee pressure cooker. Stop in next time you play Sydney Marovitz and hit a 5-minute warm-up session in the simulator!